When is the last time you checked your smoke alarm and carbon monoxide alarm? Own up time – we checked ours a couple of times after we moved into our new house but haven’t checked our smoke alarm for a few years! Without a prompt or a reminder, it had not crossed my mind as it becomes inconspicuous. Also, we only installed our carbon monoxide alarm early last year due to our boiler broke down but we haven’t checked it since. Last week was Gas Safety Week and I am so glad to be introduced to Nest Protect. They are a smart combined smoke & carbon monoxide (CO) alarm. Now you won’t need to drill plenty of holes to install two different alarms. Nest does it both! It also does much more than just sound a shrill alarm when there’s danger in your home. Nest Protect speaks to you, telling you where the danger is and what the problem is. And before it sounds a piercing alarm, Nest Protect gives you a friendly Heads-Up warning telling you what and where the danger is. They are also very smart! It connects to your mobile devices and messages you if the batteries run low, avoiding that all-too-familiar midnight low-battery chirp. Nest also has a Pathlight that glows white at night to light your way in the dark as you pass below it. Before you install the Nest, you need to start it up with the app on your smart phone or gadget. I set it up using my iPad and it took me about 5 – 10 minutes to get connected. You need your WIFI password, so have it handy with you. Once the Nest is connected via your gadget, you are ready to install it. Wall plugs are not provided, so it is best to get big size wall plugs if you are inserting it on a new ceiling or just use your existing holes when swapping it with your old one. Nest can be installed on ceilings or walls, just make sure you find the best place to install. Once the backplate is screwed on to the ceiling, place the Nest and twist it slightly to lock it in. It is very tight once locked in. The design and the colour of the Nest is modern and stylish. I think it could be easily mistaken for a trendy looking speaker. It also comes with eye-catching light ring in the middle. I love how the white light glows when we walk past it. The alarm speaks with a human voice and would alert you to the different type of alarm. I think it is quite soft voice and it should not scare anyone especially young children. I still remember my old smoke alarm kept beeping loudly when there was no smoke nor fire and it really deafened us when we went close to check it. With Nest, it would communicate with you via the alarm and your phone. You get a clear diagnosis each time. You wouldn’t have to guess what is wrong and the beeping won’t hurt your ear. The RRP is £89 and available to buy from Amazon, Apple Store, B&Q, John Lewis and Nest.com. I love the design and the smart idea behind Nest. It definitely suits the modern home and with the app, it makes life easier to diagnosis the problem. Watch this video and see what you think about it! 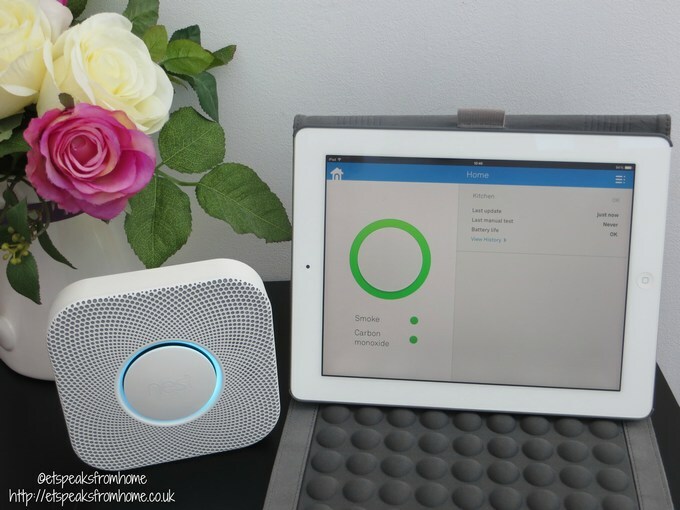 Now Nest is giving one Nest Protect worth £89 to ONE of my followers! So good luck and enter through Rafflecopter! Also, remember to check out the rest of my giveaways!